PA Chairman's spokesman responds to Netanyahu's speech at the UN, says PA wants a state in accordance with UN resolutions. Palestinian Authority (PA) Chairman Mahmoud Abbas’s spokesman, Nabil Abu Rudeineh, responded on Monday evening to Prime Minister Binyamin Netanyahu’s speech at the United Nations, saying that the solution to the Arab-Israeli conflict should be based on the decisions of legitimate international institutions, on the Arab Peace Initiative and on the UN General Assembly resolution of November 29, 2012, in which “Palestine” was recognized as a non-member observer state at the UN. Abu Rudeineh added that the solution should lead to the establishment of a Palestinian state with its capital in eastern Jerusalem. In his speech, Netanyahu linked subjects such as Hamas, ISIS, Iran, anti-Semitism, and Israeli-Palestinian issues to the theme of global partnership and the war against global jihad (and, by extension, extremism). He said that "Hamas is ISIS, and ISIS is Hamas. And what they share is what all Islamism shares: [. . .] they all have the same ideology, they all seek to establish a global militant Islam - where there is no freedom." "To them, anyone can be considered an infidel, including fellow Muslims," declared Netanyahu. 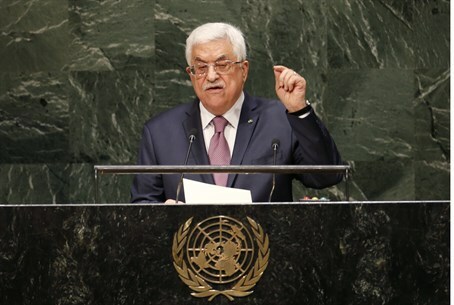 The speech also focused on refuting claims by Abbas in his UN speech last week, in which he accused Israel of “genocide” and “war crimes”. "Hamas cynically used schools - UN schools! - and hospitals, and mosques to house civilians, as Israel surgically struck to eliminate terrorists," Netanyahu said. "We were not [targeting civilians]," Netanyahu fired. "We regret every civilian casualty." He noted that the IDF took many measures to warn Palestinian civilians ahead of every strike. "No other army in history has gone to greater lengths to prevent civilian casualties in the population of their enemies," he noted, to applause. "They upheld the highest moral values of any army in the world." "Israel's army deserves the admiration of decent people everywhere," he added, to applause. The Palestine Liberation Organization (PLO) denounced Netanyahu’s speech, accusing him of “blatantly manipulating” the facts when he compared Hamas with the Islamic State and Iran. "Netanyahu's speech at the UN was a blatant manipulation of facts and attempted at misleading the audience through a combination of hate language, slander and argument of obfuscation," PLO executive member Hanan Ashrawi said.